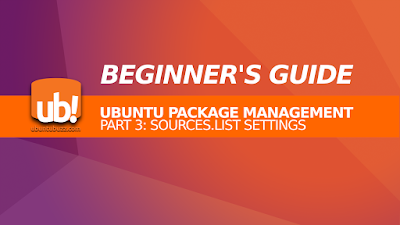 This beginner's guide Part 3 talks about Ubuntu repository address settings in sources.list. By learning this article you understand what is sources.list and how to setup it according to your needs. 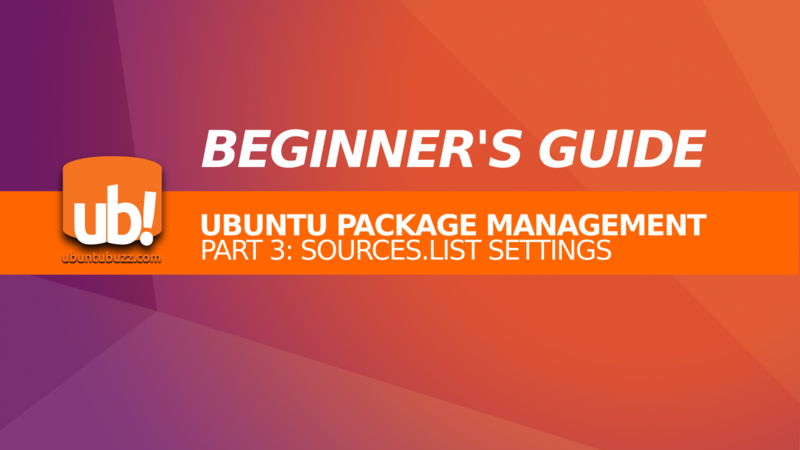 In Ubuntu, APT will know what repository to access and what packages to download primarily based on your sources.list settings. So sources.list is very essential for your APT system. This article explains the terms (4 "channels" and 4 "rooms"), gives many practical examples, how to edit, and adds summary and references at the end. I use Ubuntu 16.10 Yakkety Yak for example in this article. And this article is a continuation of Beginner's Guide Part 2 Basic Apt-get. I hope this part is easy for everyone to understand. What is repository? A repository is a place storing software packages dedicated for a GNU/Linux operating system. Repository is created by the developer of a GNU/Linux operating system, by transforming software from source code into binary, producing a “package” file (.deb) for each software. Repository is located in internet as a server, it allows anyone to download packages. Ubuntu users download software from Ubuntu repository. That is how it works. To give you more precise sense about Ubuntu repository, notice these facts: every GNU/Linux distribution has its own repository, a repository composed from ten of thousands packages stored in structured directories, Ubuntu repository is divided in 4 channels and each channels divided in 4 rooms, and a repository provides binary and also source code version of each software. main: contains free software, maintained directly by Canonical. restricted: contains nonfree software, maintained directly by Canonical. universe: contains free software, maintained by community. multiverse: contains nonfree software, maintained by community. Note: please notice that this term "room" is from me, this term is unofficial. $release: the standard channel, you can live in Ubuntu by only using this repo. $release-updates: the software update channel, use this to get new version of a software. $release-backports: the new version from future Ubuntu release, use this to get the far more new version of a software or even new software not existed in previous Ubuntu repo. Note: please notice that this term "channel" is also from me, this term is unofficial. What is mirror? A mirror is a copy of repository located somewhere else in the internet. So there is an official repository, and there are mirrors of official repository; they all are containing exactly the same software packages. A mirror is created typically by some third-parties (individuals, or universities, or companies) willing to help the official GNU/Linux repository available more widely. By providing a mirror, it means that users don’t need to download software packages directly from the official repository, but instead they can download from a local mirror repository in their country. A mirror created helps the official repository server. It is clearly a form of cooperation. It is because the amount of download connections decreased at official server when many users switch to another mirror. Being able to edit sources.list settings means able to use local mirror. What is sources.list? A sources.list is a file containing list of repository addresses. APT knows all available packages and where to download them based on settings inside a sources.list. A sources.list file is primarily important for APT and a whole Ubuntu system to install/upgrade software. This file is located at /etc/apt/sources.list. What is sources.list.d/? The sources.list.d/ directory is a system directory containing another secondary sources.list files that store additional or third-party repository addresses. This directory is located at /etc/apt/sources.list.d/ in Ubuntu system. There are two ways to read sources.list: one with Terminal, one with GUI. GUI way: open the program Software & Updates from Ubuntu menu or run the command line $ software-properties-gtk. You will see the exactly same sources.list settings but in nice GUI options. However, I do not explain the GUI way in this article. Do not get confused. This default sources.list content indeed looks very long and complex. But once you understand the structure (explained below) you won’t get confused, then you may safely delete the default content and replace it with your own settings. 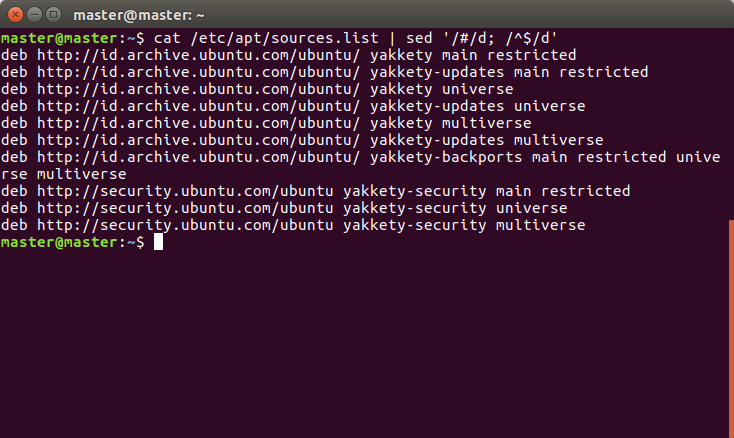 Important: again, do apt-get update command every time you change the sources.list content. Without that, APT knows nothing about your newly added repository address. This is the generic structure of a sources.list setting. It’s like poetry. Pay attention to the “4 rooms” and the “$release* code” in every “stanza”. The 4 rooms mentioned means they are all enabled, the 4 release channels mentioned means they are all enabled. The very long generic structure above can be simplified into only 4 lines like this. Pay attention in how 4 rooms written, and how the 4 channels is located. 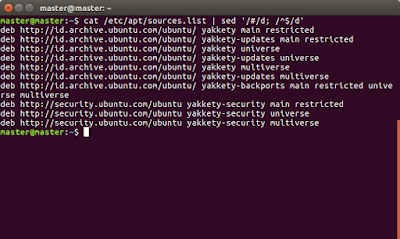 This general structure enabled all channels and all rooms in Ubuntu repository. Now, you should understand how to use that generic structure in a real sources.list. For this purpose, I show you here two examples of sources.list: one for 16.10 yakkety and one for 12.04 precise. Both have all channels and rooms enabled. Pay attention to how [$release*] code replaced, and how [URL] changed. This method of setting is applicable to all Ubuntu release versions. Because this article is for beginners, here I show you how it looks when sources.list changed using (a) and (c) examples above. I use Gedit as text editor here. Ubuntu GNU/Linux distribution distributes software in binary form and also source code form. This means Ubuntu has binary repo and also source code repo at the same time for each release. What I mentioned above is all about binary repo, they are composed of .deb packages. So I mention here about source code repo, the repo composed from .tar.gz packages. Every Ubuntu user receives the right to access source code of every part of Ubuntu GNU/Linux distribution completely. So whenever you need or you wanna try source code, you can enable the source code repo. This section give you the basic understanding about it. Notice the only difference now is the deb-src code at the beginning of line. The deb code represents binary repo, while you use it then you enable the binary repo. And the deb-src code represents source code repo (source = src), while you use it then you enable the source code repo. Pay attention at two "stanzas" above: they are both the same except deb-src is for source code. Those two stanzas enable both binary and source code repositories, enable 4 rooms in every of 4 channels; in other words, this setting is the most complete all-repositories-enabled possible for Ubuntu. To disable any of them, just use the same disabling method (using '#') already explained. Here is a summary of this whole Part 3 Sources.list Settings article. Sources.list is repository address setting for APT. Once a sources.list changed, apt-get update should be invoked. To disable an address, put ‘#’ character on the beginning of its line. To re-enable an address, remove ‘#’ character on the beginning of line. Ubuntu sources.list composed from 4 channels with 4 rooms each. Ubuntu sources.list composed from binary (deb) and source code (deb-src) repositories. Ordinary users generally just need binary repositories (deb) for 4 channel x 4 rooms.